Stiletto nails are named after another long, pointy fashion staple – stiletto heels, which, in turn are named after the Italian slimline dagger. Filed, or sculpted, to a smooth, thin point, like the heels, they’re fierce, they stand out, and they command attention. True stiletto nails are immediately eye-catching and the height of femme fatale glamour. If you’re going to go for the full dagger look, you need to think looong nails – this style cannot be compromised on. With gels and acrylics improving in durability all the time, it is perfectly possible to sculpt the perfect point with length and slenderness. Obviously, they look amazing in bright scarlet, but deeper colours suit the sharpness really well, too, as do accent gemstones, or a touch of glitter. The new chrome or holographic polishes bring a space age, high tech metallic edginess to your nails. I just wish I had more reasons to wear these beauties – I love them! So, I’ll try to remain unbiased while I test out the latest best-selling stiletto nails. These false nails from EcBasket feel lovely and solid. Whilst not as pointy as some, they are a beautifully practical shape and length for normal life, as opposed to the catwalk. Being made from ABS, these nails are environmentally friendly, non-toxic and reusable, and come in a variety of sizes. I found that the color went on smoothly, with no tell tale brush marks, and the nails stayed in place for over two weeks. When filing, I found that to avoid a ragged, untidy finish, stroking gently, with a decent file, in one direction was the key. The one that’s included is not up to that task, unfortunately. If you’re after durable stilettos that fit well, look amazing and stay in place, these nails are awesome. 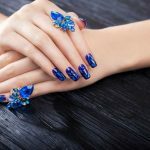 These BeYou salon quality stiletto nail tips are as reliable as BeYou’s other additions to the fake nail market, have clearly defined points and lovely sharp edges. Once the natural nail is built up, they are completely solid and not going anywhere. This is what I did, and as a result, kept them on and looking awesome, for nearly two weeks. Because these are tips, their stickability does tend to rely on the quality of your nail build up. If the build up is good, they can stay in situ for a long time. These stiletto nails are perfect if you're looking for staying power. Points also go to the beautiful stiletto shape and the comfortable length. These are sharp, deadly and durable. Coming in a variety of lengths and widths, they have a very natural looking curve, and once attached, look awesome. Polish goes on smoothly, covering and adhering well, and even with weighty 3D art, these nails feel solid and reliable. I kept them on for two weeks, but they would have stayed in place for longer. With ‘only’ 500pcs, I need a bigger packet! For length, drama and strength, these are coming home with me! High Quality Material :AORAEM 500pcs Stiletto Nail Tips are made with high quality ABS material, which is thick and sturdy enough to last about 2-3 week.It's kind of environmental friendly material, without toxic and will not harm your nails or body.